It is my love letter to three generations of women. It includes many varieties of love, as well as of hatred. It is the story of both valiant and villainous hearts. Careful Flowers by Kieran York is about a woman whose life has been careful. She finds that nothing is as she believed it to be. Life suddenly becomes an unknown. Fleur Hamilton is botanist with an important project and a pending grant. She’s in a relationship facing a crossroad. Her love for the woman in her life has taken a critical turn. As she enters her fourth decade, she finds not only her relationship being topsy-turvy – but everything in her life has capsized. She has lost her beloved great aunt. Ever the scientist, she becomes obsessed with discovering the truth about her aunt, and about her own roots. It takes an examination of many lives for her to locate her own historical truth. As she slowly uncovers her parents’ Hippie Era and their lives, she also discovers more about her Great Aunt Golda’s life as a prisoner of the Holocaust. Fleur is forced to make a horrific decision. Her unearthed heritage strengthens her as it directs her. Love, hatred, kindness, and evil overwhelm her once tranquil life. It is the flowering of a treatise of what went before. Fleur’s emotional journey comes with not only a tour of history, but it includes the by-stories of each era. Her odyssey to San Francisco is where she first discovers both her personal past, as well as her unique humanity. She unlocks her background by unwrapping her parent’s Hippie Era. She uncovers her beloved aunt’s understanding of both love and hatred. She sees the world of a Holocaust survivor as it unfolds. Her adventure becomes Fleur’s own history. As the stories are layered, they converge for Fleur to discover herself. She can then deal with not only her broken relationship – but her future. It is today’s story of yesterday. Careful Flowers is available in book from through www.bluefeatherbooks.com. Or order through Bella Book Distribution for books or e-books. Books and Kindle e-books are also available through Amazon. If you’re interested in poetry, check out her poetry in the best-selling Sappho’s Corner Poetry Series: Wet Violets, Volume 2; and Roses Read, Volume 3. , and Delectable Daisies, Volume 4.-isThe collections are edited by Beth Mitchum. They are available through http://ultravioletlove.com and Amazon. Also available through ultravioletlove.com/ and Amazon is the book of poetry by Kieran York Blushing Aspen, Sappho’s Corner Solo Poetry’s Series, Volume 4, edited by Beth Mitchum. Awaking to life’s kiss is a tender territory. The blink of night’s shade lifts. At the horizon’s edge, lips are half-opened, and awaiting. directing us toward our day. Steeped in intensity – lands, oceans, and skies rally. A chunk of forever is actualized – and becomes our very own. we debark from the cavernous wombs of destiny. we eagerly spur our spirits. And we thrust our bodies toward life’s love affair. We interlace with both the finite and the infinite. and wing a path through the air. Migratory, with great compulsion to search, we drift. we have been shackled by those obtruding our freedoms. For territory, we have fought, and been protective guardians. We have influence, as good devotees of all. We have crossed a thin rope – from canyon’s sides. within the musculature of greed and hate. We seek always to locate others – and ourselves. chaining us to the luminous dial of existence. have been sullied, trampled, obliterated, and destroyed. We’ve committed betrayal, adultery, and murder of our planet. With gluttony, we’ve siphoned one another’s prosperity. We’ve pilfered one another’s bounty. Earth’s eternal crest is ablaze with immense splendor. It asks nothing in return; demands nothing. We clench tightly to each woven wrinkle of territory. We drain the waves as seas lift and curl. We poison precious morsels of air. This home, our shelter, has long embraced us. we are clothed by all that is the globe. and each breath pressed inside us. Uniquely formed, tangible and intangible gifts are borrowed. through the vastness of the heavens. Nutrients for our imagination are rarely depleted. We unveil and forfeit the riches of this planet – for profit. Weeping, I wonder why we haven’t understood our acts. We might have realized the truth earlier. Please check out my poetry in the latest, best-selling Sappho’s Corner Poetry Series:Wet Violets, Volume 2; and Roses Read, Volume 3. Edited by Beth Mitchum, the books are available through http:ultravioletlove.com and Amazon. If you’re interested in romantic fiction, please consider the Lambda Award Finalist (2013) Appointment with a Smile by Kieran York. Books are available through www.bluefeatherbooks.com. Or order through Bella Book Distribution for books or e-books. Books and Kindle e-books are also available through Amazon. And watch for the latest fiction release, this month – Careful Flowers! Childhood should be a time of lighthearted days. This is often the case, and sometimes not. But I invite you to take a rhyming journey with me – for a feel-good glance back. All aboard for yesteryear land. If you wish to go, please take my hand. We’ll wander along to distant treasure. We’ll journey back to homespun pleasure. blue and clear, have no fear. You’re the captain of your ship. And off we’ll go on our little trip. Hang on tight with all your might. We’re going right to see the sight. sugar dolls on gumdrop lanes. Kids on parade drink pink lemonade. Bright blue bicycles race gleaming red tricycles. Listen to the hurdy-gurdy sound. A Jumping Jack has licorice in a sack. A tiny red fox plays in a sand box. and a giggle says that all is fine. Animal crackers eat jelly beans. Lollypop signs point to silly scenes. We’ll have great times in this place I know. across the sea of make-believe we’ll go. we’ll all wear special funny hats. Hoist away, spread the sails. We shall wait for husky gales. They’ll float our ship across the blue. We’ll travel ever and ever anew. we’ll wiggle our toes in glittering sand. inside a huge toy store. hear the squeals we’ll make. Now comes the shakes, malts, and soda pop. If we spill, whoops, here comes the mop. Candy will sprinkle out from the sky. Paper airplanes swirl as they fly. Chocolate, gingersnaps and laughing we are. We’ll charge up a mountain to touch a star. After all, it isn’t that high. Not if we reach and really try. We’ll run in the meadow, then climb a hill. We’ll eat Cracker Jacks until we get our fill. We’ll jump and run; then waltz with the sun. we’ll wander on home and hop in our beds. We’ll pull up the covers and then the spread. we’ll return to our own special lands. We’ll wake blurry-eyed to wait for our friends. And off we’ll travel around twisting bends. coming down the well-worn track. It will pick us up to take us shipside. We’ll ready our departure to take a ride. There are flowers with colors all aglow. The hills ahead spread like a huge rainbow. from a magical flower in our playroom. Childhood is bright as all the sun’s rays. So let’s recall the best of our sweet days. is the best kind of lighthearted yesteryear. Please check out my poetry in the best-selling poetry collections, Sappho’s Corner Poetry Series: Roses Read, Volume 3; and Wet Violets, Volume 2. Edited by the award-winning poet, Beth Mitchum. These books and other wonderful books and music are available through http://ultravioletlove.com and Amazon. If you’re interested in romantic fiction, please check out Appointment with a Smile, the 2013 Lambda Finalist in the Romance category, by Kieran York. 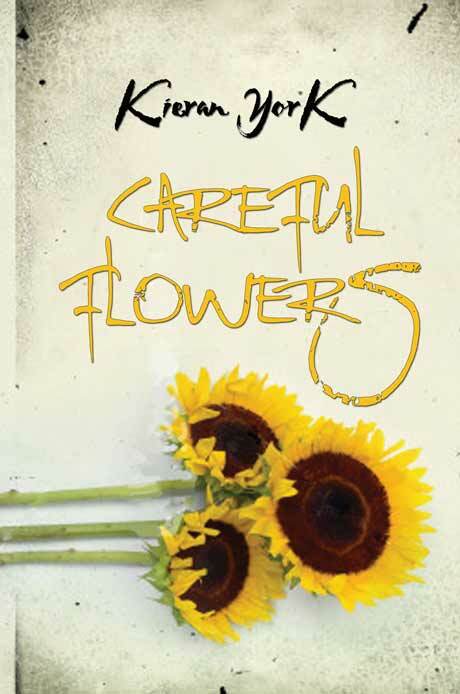 A new book is scheduled for release in autumn of 2013, titled Careful Flowers. Books are available through www.bluefeatherbooks.com. Or order through Bella Book Distribution for books or e-books. Books and Kindle e-books available through Amazon.